The Dada Sprees Supreme atheletic shoes have an unusual feature - a "spinnah" built into the outside wall of the shoe just above the ankle. When you put pressure on the heel of the shoe (when walking or jumping), the spinner moves. So, the shoe harnesses some of the ordinary energy of walking, and does something with it. Thinking about Parasitic Power-Harvesting in Shoes? Okay, maybe not. But the idea of putting the ordinary energy of walking to work is used in the stillsuit from Frank Herbert's epochal novel Dune. The energy of walking (and other aspects of locomotion) is put to work recycling moisture for reuse. How much power is available if you parasitize human walking? See the original article at Walking on Dubs. 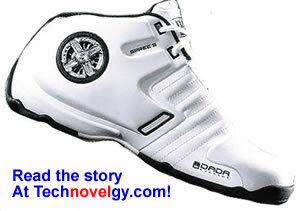 Go to the company website and see Dada Spree Supreme shoes.